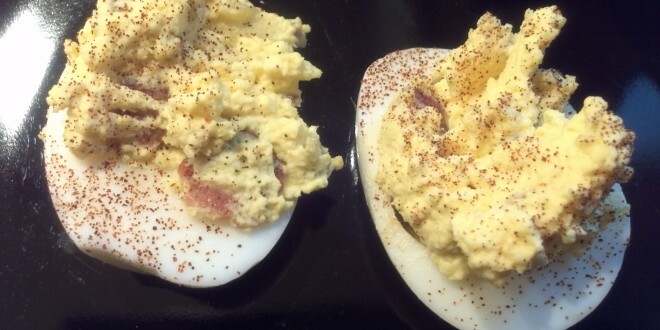 Deviled eggs are a classic keto friendly food. So what better to do than add bacon! 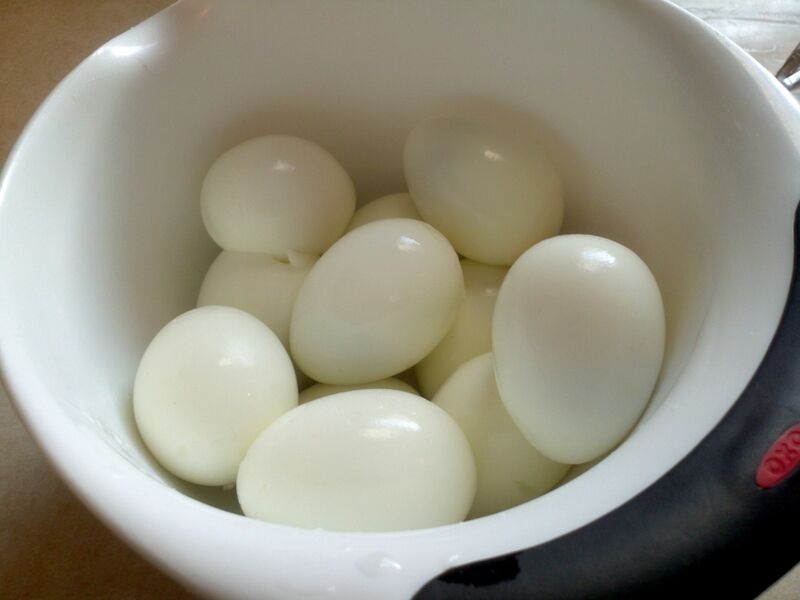 Start by carefully placing the eggs in cold water. Make sure the water covers about 1 inch above the eggs. If you have your own method of boiling eggs, insert it here. Personally, I wait until the water boils and then boil it for 15 minutes. When they are done, dump the hot water and submerse the eggs in cold water. 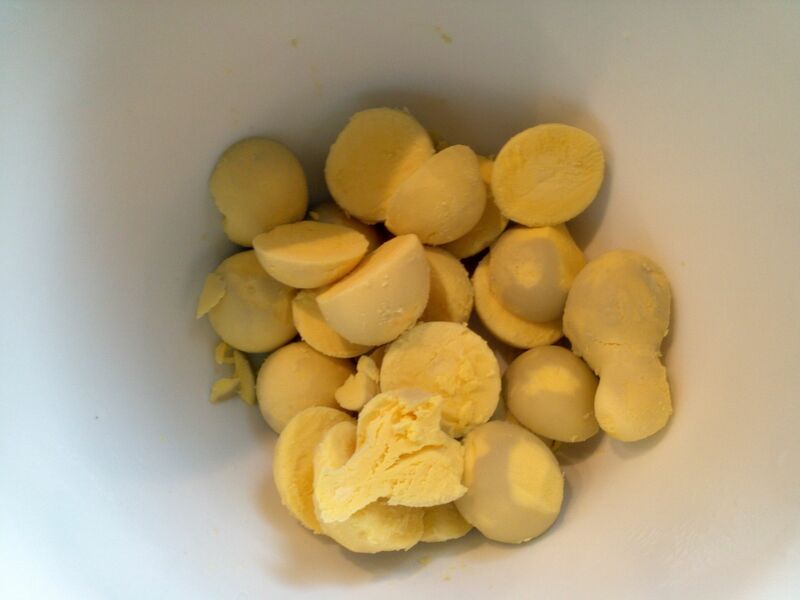 Then take the eggs and crack them against the slide of the pot till they look like this. 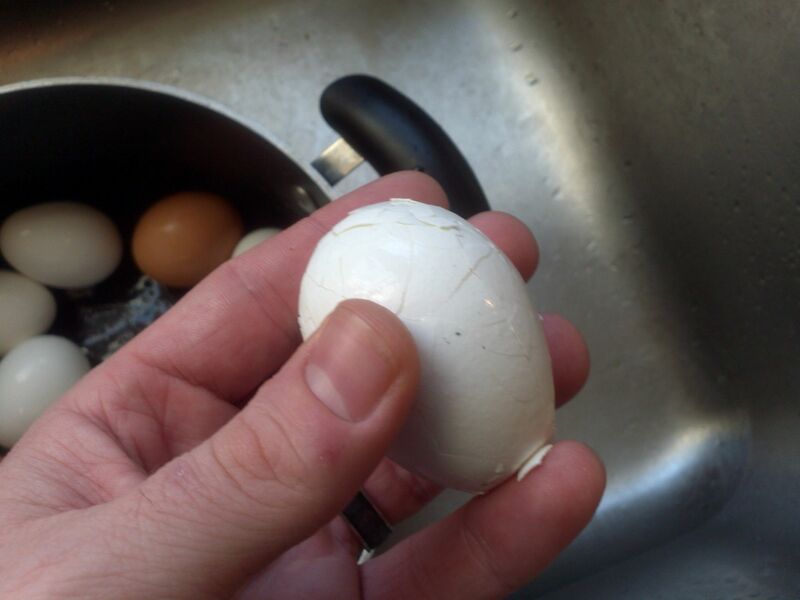 Once they are cracked, roll the egg between your hands. The shell should just flake off. If you are new to peeling eggs, the key is to realize that there is the shell, then a thin meniscus, followed by the egg white and then the yolk in the center. Ideally you want to get under the meniscus and then the peeling goes very smoothly. If the shell is just flaking off, but your not under the meniscus, the peeling will be very difficult. Another common problem is that the meniscus does not peel away and is basically stuck. This makes peeling hard and most likely this is a result in either cooking the eggs too long or too little. 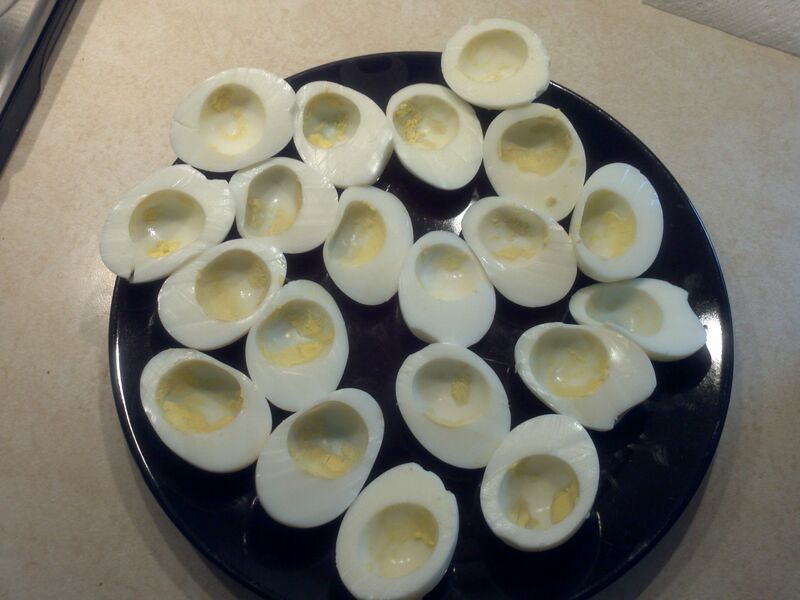 Here are the peeled eggs. Make sure they are dry. Here are the three steps of the deviled egg process. 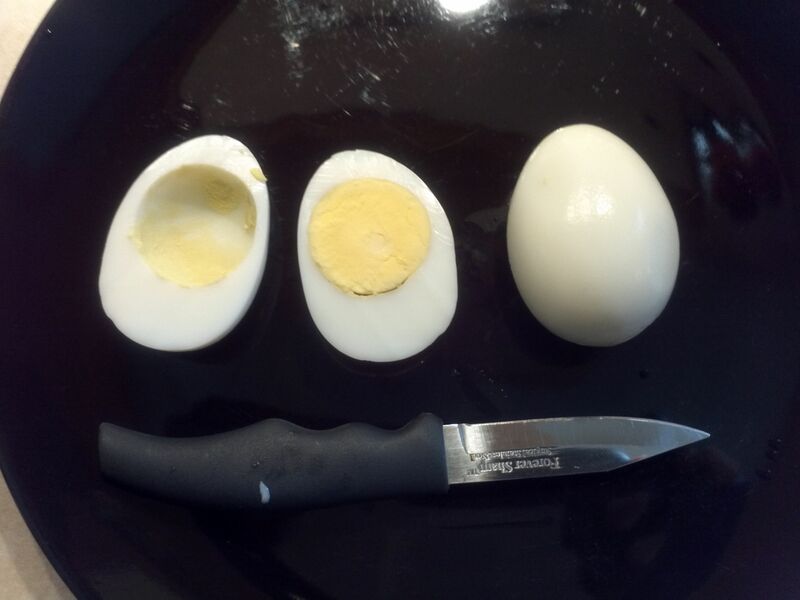 Start with the boiled, peeled, dry egg and cut it in half lengthwise. Then you will see the yolk in the middle of the egg white. Pop the egg yolk out by gently pressing from the back. Do this for all of the eggs and put the yolks in a separate bowl. Here are the emptied shells. 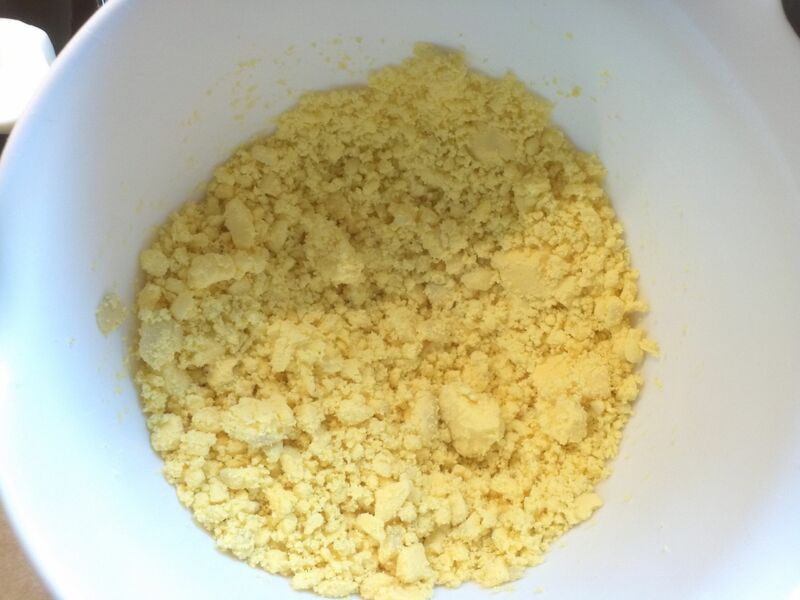 Start by crumbling the egg yolks with a fork till its about this consistency. Add in the wet ingredients and mix it up. There are many options but I put in Mayo and no sugar added pickle relish. I generally just add mayo in dollops until it reaches the consistency above. 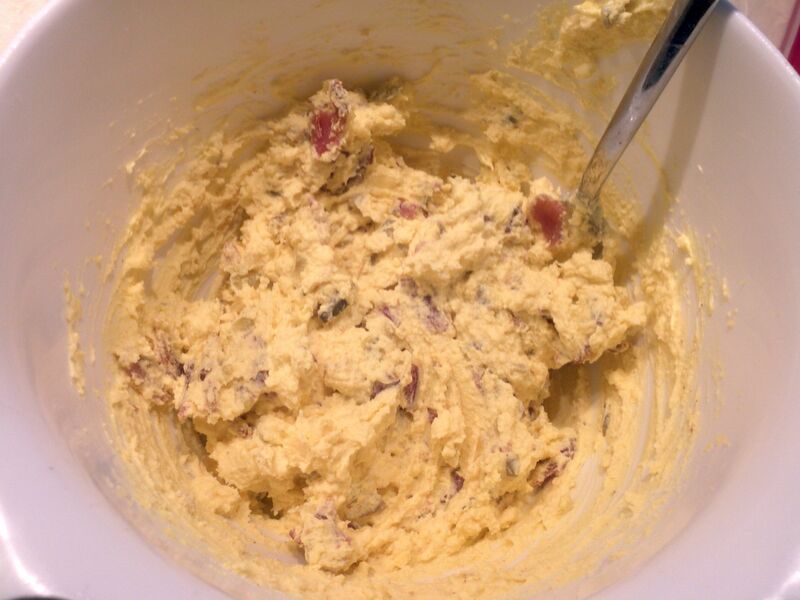 The final step is to mix in some crumbled bacon! 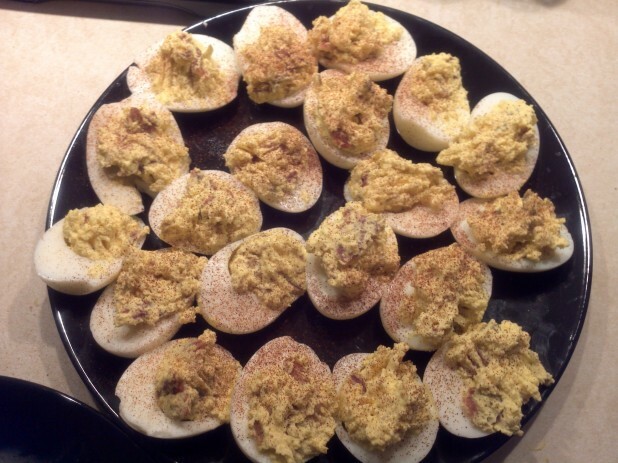 Here are the finished deviled eggs! I sprinkle paprika over the top to finish them off. Awesome! I love that you included how to peel and the little things about the egg. I remember not having a clue on things like frying ground beef and little comments similar to your description helped me a lot. However, paprika isn’t a good addition. It increases bacteria and changes the flavor. Some like it, some don’t – so best to leave it off and people can add it themselves. As for the bacteria, I think Myth Busters looked at it. Basically, it increases the surface area for the bacteria to attach, so they do, and their count goes up by ~1 billion (not really that high). Unrelated to that, does your family serve them before or a meal or as part of it? My family always had them out for when people would come into the kitchen looking for a snack. My in-laws scolded me for this as they put them on the dinner table. My family always had them out prior to dinner but also had them on the dinner table. Great recipe! I’ll be making these later this evening! I use myfitnesspal which results in overestimates. It comes from the fact that I use eggs that report 1 carb per egg. The rest is probably from the mayo. I definitely recommend calculating it with your own ingredients for the most accurate measurements. If you pour in a bit of vinegar (white is fine) into the water where the eggs are boiling, then after you take the eggs out (while still hot), submerge them into ice water, the yolks will be bright yellow (not that gray-green they sometimes get), and the shell slides off in like three moves-no little shell peices! I’m not sure which ingredient is responsible for which action, but they are both pro’s. Try it next time! Great recipe! 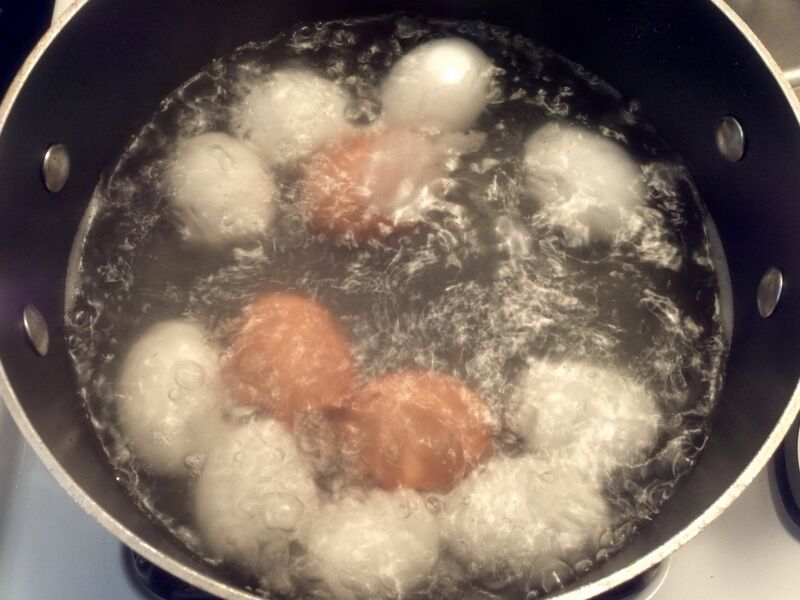 My only qualm is with actually boiling eggs for 15 minutes straight – not sure I’ve ever heard that advice before! Generally, you put them in cold water, covered by an inch or two of water, gently bring to a boil, let boil maybe 1-2 minutes, then cover and remove from heat (or just turn off burner), allowing to sit in the hot water for 15 or so minutes. Yeah, there are a ton of different ways to boil an egg, I think mine is a little overdone as you said. Thanks for the awesome recipe! Found your website online and look forward to trying more of your recipes through my Keto journey :-). 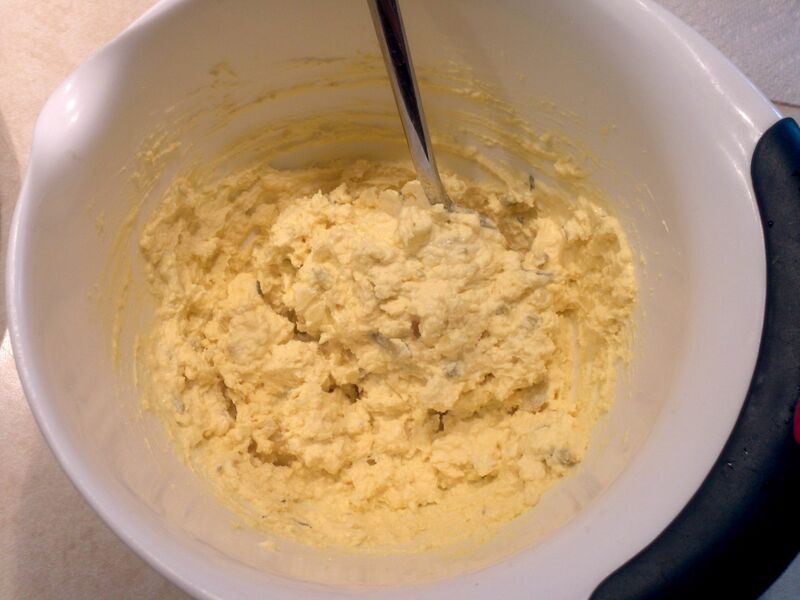 If you use good farm fresh eggs you won’t have to worry about yolk color. It will be the bright orange/yellow as they should be. 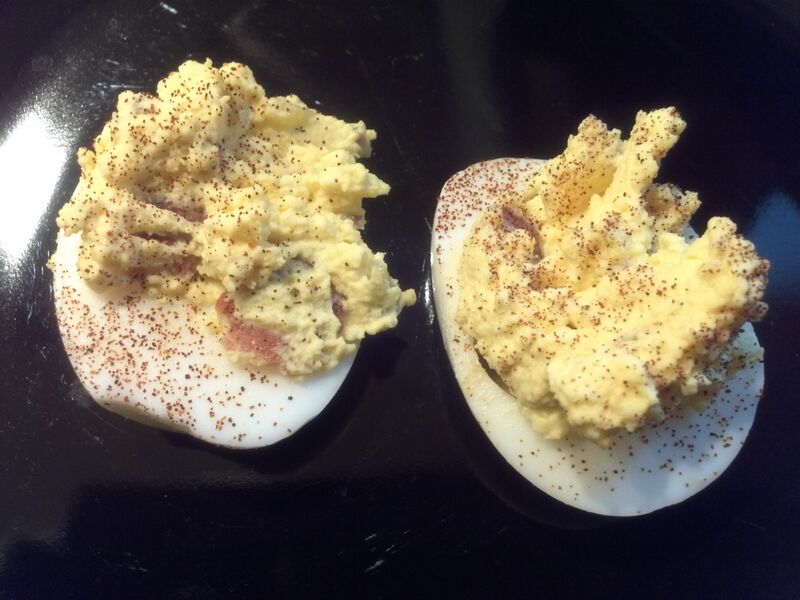 Thanks for the idea of adding bacon to deviled eggs, the perfect compliment. I’ve been told that if it’s grey on the outer yolk it means it’s been cooked too long. These are great! I also add some shredded sharp cheddar cheese for a little something extra. 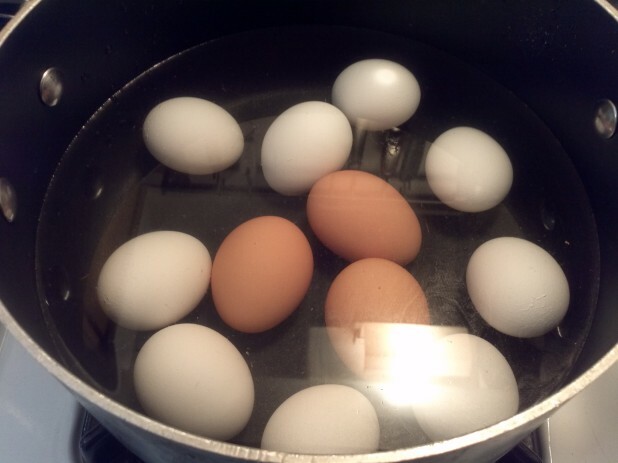 I personally eat a dozen eggs a week and on Sundays is when I prep and hard-boil them all. Might be doing this for my eggs tomorrow!